The New Colony and Definition Theatre Company’s three-time 2016 Jeff Award-winner “Byhalia, Mississippi” returns to the Chicago stage at just the right time. This is an election year, and in fact, as the work made its press debut Monday night at the Steppenwolf 1700 Theatre, DNC 2016 was just getting underway. Last week’s RNC, a literally whitewashed affair that did much to trumpet (pun definitely intended) fear of thy neighbor (especially when he or she is brown-skinned) and this week’s Democratic vision of evolving inclusiveness: they feel like appropriate bookends to an important artistic exercise in taking a hard, extended look at the tensions of now. Poverty versus privilege, evolving racial attitudes in the Deep South, gendered politics — these are just a few of the issues the work tackles. And “Byhalia, Mississippi” does so without the sort of preachy, heavy self-seriousness that often derails entertainment into the realm of propaganda. The script is laugh-out-loud funny, achingly human and brilliantly acted by the returning original cast. At times the scenes are tough to watch. It is a persistent challenge to audiences, with underlying questions that any thinking person will take home to consider. Are we obligated to live honestly (a much different query than interrogations of “truth”)? And how far have we come along the path of universal acceptance? What’s narratively fascinating is that Jim and Laurel are two people who betray and hurt each other. They are exposed to scandal and in fact, Linder and Sharpe spend a lot of the show’s two-hour and 15 minutes running time acting in different scenes. Though the characters are frequently separated and estranged by some corrosive internal and external influences, they ultimately remain each other’s “plan.” Their relationship reveals that there are elements of choice involved in matters of the heart. This is existentially comforting somehow, even if the road to reconciliation is a humiliating, rough ride. These are not “good” people, and the dialogue goes to painstaking effort to suggest that there’s no such thing. But even as their lives come completely apart and others are waylaid as so much collateral damage, the bond between Jim and Laurel is perversely inspiring. And dammit, incongruity is a cold, naked human reality. This critic had grateful tears running down her cheeks during the production’s touching, soft ultimate scene. Linder and Sharpe are terrific, as is every other performer on the stage. Cecilia Wingate, who plays Laurel’s stuck in the Jim Crow era but still somehow overbearingly lovable mother Celeste, — she’s a revelation. One of the three Jeff Awards doled out to “Byhalia, Mississippi” in 2016 include a Best Actress in a Supporting Role nod for Wingate. So well deserved. Talented is the actress who can engender genuine, complicated sympathy in a character who might be unlikeable under another’s care. The writing from the playwright, lead actor, and New Colony Co-Artistic Director Evan Linder is fast, organic and complicated. Tyrone Phillips directs his experienced cast and crew with the fluidity and familiarity of an artist who understands the power of dialogue. “Byhalia, Mississippi” needs no special effects to have an explosive impact. And the intimacy of the Steppenwolf’s new 1700 Theatre is a perfect fit for such deeply personal material. Highly recommended Summer 2016 viewing at a critical juncture for the determination of 21st Century American values. 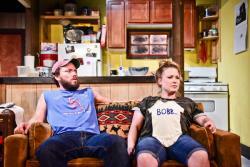 “Byhalia, Mississippi” runs through August 21 at the Steppenwolf 1700 Theatre, 1700 N Halsted Street, Chicago, IL. For information or tickets, call 312-335-1650 or visit the Steppenwolf Theatre website.